NBC's Janet Shamlian reports from Pass Christian, Miss., where Hurricane Isaac has completely flooded roads and destroyed a marina. Isaac dumped relentless rain on southern Mississippi as it moved north from the Gulf of Mexico on Wednesday, flooding low-lying homes and highways, washing away a pier and knocking out power to thousands of residents. Schools and many businesses closed, and city officials reported flooding and downed trees and power lines. No major injuries were reported in the state. The scale of destruction was much less severe than during Hurricane Katrina seven years ago almost to the day. 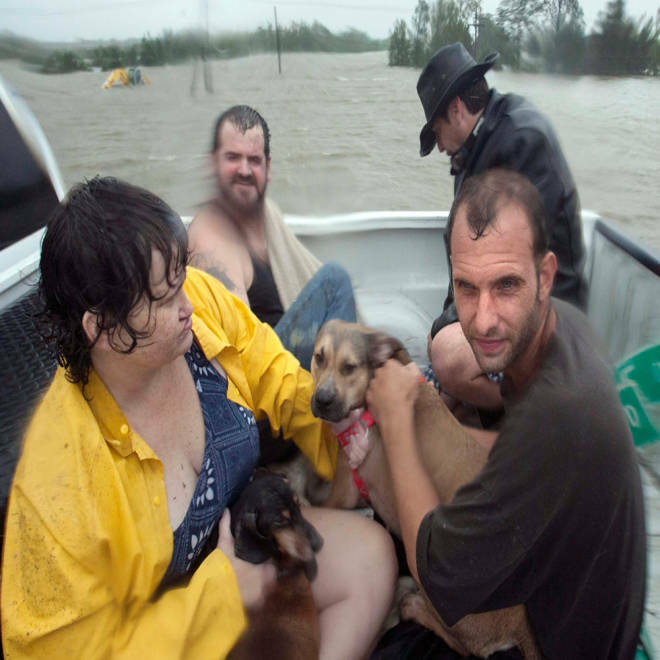 Katrina obliterated some coastal towns in Mississippi and left more than 230 people dead in the state. Isaac, which had been a Category 1 hurricane, weakened to a tropical storm by midday Wednesday and a gradual weakening was forecast over the next 48 hours as it continued to move farther inland. Utility companies said more than 24,000 south Mississippi homes lost power earlier Wednesday, most in areas of the three coastal counties of Jackson, Harrison and Hancock. Other scattered outages were reported in portions of south Mississippi north of the coast. Hancock County Supervisor David Yarborough told The Associated Press that Isaac washed away a county pier in Bay St. Louis. "From all indications it's not going to be a major wind event. It's going to be a water event," Bay St. Louis Mayor Les Fillingame said, according to the Sun Herald. 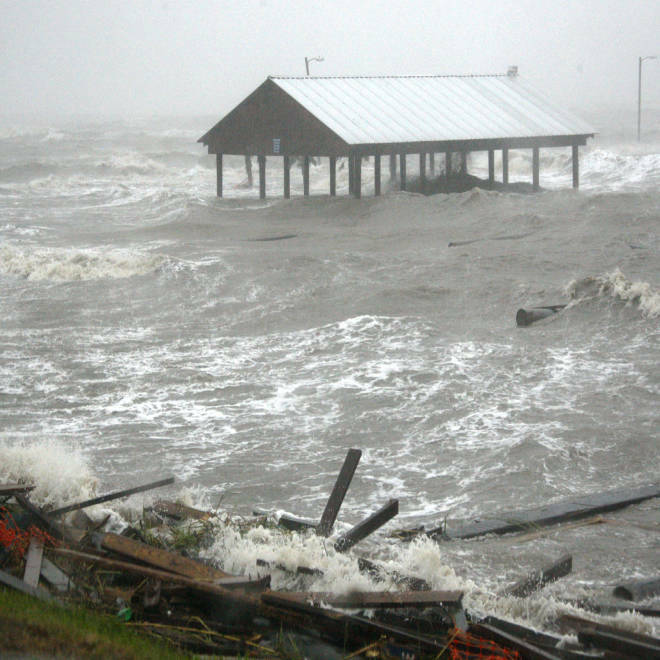 Gulf waters swamp an American Legion fishing pier in Bay St. Louis, Miss., as Isaac's winds and storm surge flood some low-lying neighborhoods on Wednesday. In Waveland in Hancock County, floodwaters surrounded the building housing WQRZ radio in Shoreline Park. Brice Phillips, leader of the station, told the Sun Herald he called emergency management to come rescue three staff members while he stayed behind to keep the station running. Brian “Hootie” Adam, Hancock County emergency management director, told NBC News it wasn't immediately clear how bad the flooding was in residential areas because crews were unable to get to the houses. “We’re kind of hunkered down to the point where we’re not doing a whole lot of traveling,” he said. In eastern Biloxi, water stood 2 or 3 feet deep on parts of U.S. Highway 90, which runs past casinos, The AP reported. The Mississippi Gaming Commission ordered coast casinos to close Tuesday before Isaac pushed ashore in Louisiana. In Diamondhead, Miss., population 2,000, City Manager Richard Rose said about half the city lost power. "Everything on the south side of the interstate in Diamondhead is impassible," he told The Sun Herald.